Modern technology brought us a lot of new materials, substances and other goods to make our life better and more comfortable. Electricity is one of them. However, many of these goods are useful only under control; otherwise, they are useless and could be dangerous. Common sense tells us that all these goods must be separated from surroundings – they must be insulated. For instance, to drive a car we have to drive gasoline within. We cannot imagine storing gasoline in a plastic bag. It must be stored in a special reservoir to prevent leaking. Gasoline must be reliably insulated from surroundings. The same is true with electricity. Electricity is very useful as long as it is “kept” inside the cables, busbars, winding… If the electricity “escapes” from these items it becomes useless and very dangerous. This is the reason why any item that carries electrical current is covered with some type of insulation. 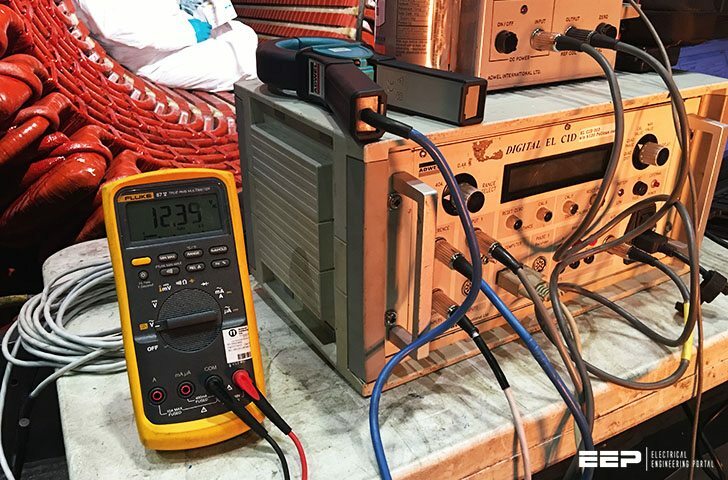 The insulation restricts the flow of current between different conductors and between conductors and ground. The insulation must be just the opposite from the conductor. The conductor is usually made from copper or aluminium, which is known to be a good conductor of electric current. The insulation is usually made from non-metallic material. It should resist current and keep the current in the path along the conductor. In theory, insulation does not carry electrical current. However, in reality we do not have an ideal insulation material. Every kind of insulation has some resistance. The insulation resistance is very high but it is not infinite. Manufacturers of wires, cables, and motors have continually improved their insulation for service in industry, at home and other places, where electricity is being used. However, the insulation in service is subject to many effects which can cause it to fail: mechanical damage, vibration, excessive heat or cold, dirt, oil, and corrosive vapours moisture from air or technological process. Combination of electrical stresses and degradation of insulation are at work as time goes on. As pinholes or cracks develop, moisture and foreign matter penetrate the surfaces of the insulation, providing the low resistance path for leakage current. Once started, different degradation processes tend to aid each other, permitting excessive current through the insulation. The leaking current cannot be seen or smelt; only the consequences can be noticed – often too late. What’s happening? I just checked and it works. Why is it that I cannot download the pdf, for HV Testing, and copper wire insulation testing…..
Have you tried in other web browsers? Try Chrome.